Ready to learn not just the 'how, ' but the 'why' behind Photoshop's most powerful features? Photoshop guru Ben Willmore believes the only way tomaster PhotoShop is to go beyond simply memorizing steps, and gain an under-the-hood understanding of the program. 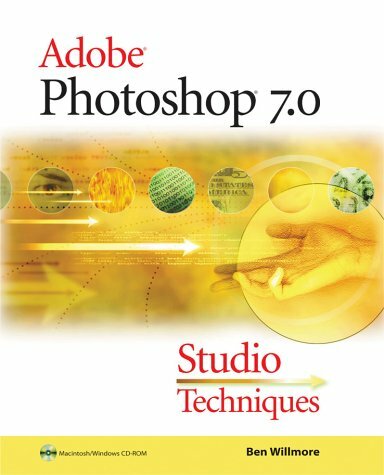 He does the job masterfully in Adobe PhotoShop 7.0 Studio Techniques, a well-known favorite that delivers the essential information you need in a fun, well-written, easy-to-read style. Rather than detail every mind-numbing feature of PhotoShop, Willmore's compact book cuts through the fat to focus on the concepts, features, and techniques that will truly make a difference in how you use PhotoShop 7 every day. If you've ever wanted to understand complex concepts like curves and channels, or learn the logic behind Photoshop's keyboard commands, look no further. Fully updated to cover the new features of PhotoShop 7, Adobe PhotoShop 7.0 Studio Techniques starts with the working foundations of PhotoShop-the basic tools, palettes, layers, and masks-and quickly moves on to real-world production techniques, such as how to sharpen scans, correct and optimize images, and use color curves to your advantage. By the time you finish the book, you'll have explored the creative aspects of PhotoShop, such as how to blend or enhance images, master colorizing techniques, and create advanced type effects. Included is an entirely new chapter on color management that gives you practical instruction on implementing a color-managed work flow from monitor to press. A section on Web graphics rounds out the book, with chapters on image slicing and rollovers, creating effects for interface design, animating effects, and optimizing images for Web. If you want to get beyond conventional step-by-step instruction and become 'Photoshop enlightened, ' this is the book for you.